Forgotten Hollywood » Blog Archive » “Forgotten Hollywood”- Another Book Award For New Work! “Forgotten Hollywood”- Another Book Award For New Work! In 2010, Forgotten Hollywood Forgotten History was an Honorable Mention in the Biography / Autobiography category at the Hollywood Book Festival. Fast forward to 2012. 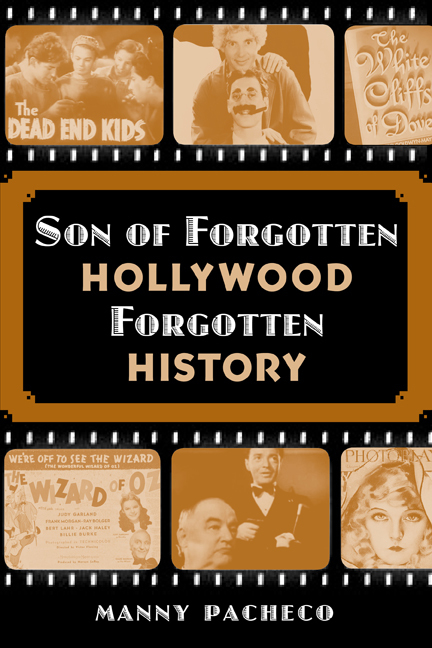 Son of Forgotten Hollywood Forgotten History has WON the Biography / Autobiography category! A gala for the entrants will be held at the historic Hollywood Roosevelt Hotel on Saturday, July 21st. Based in the capital of show business, the Hollywood Book Festival aims to spotlight literature worthy of future consideration by the talent-hungry pipeline of the entertainment industry. Congratulations to all the entries in this year’s competition. This entry was posted on Tuesday, July 10th, 2012 at 1:30 am	and is filed under Blog by Manny Pacheco. You can follow any comments to this post through the RSS 2.0 feed. Responses are currently closed, but you can trackback from your own site.